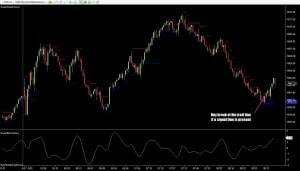 Smart Super Trend (SST) analyzes patterns on charts and order flow associated with them and marks out these area on your charts. Due to the design, you can use the lines in any number of ways to understand what is going on in the market you are trading. 2) As a trailing stop. 3) As a supply and demand pivot system. The first entry Trigger system you can use on the Smart SuperTrend is when you initially get a new line. For example, if you get a new blue line under price, then SST is telling you there is strong buying and price is not immediately likely to come down and back through the most recent bars. For any of the patterns, it tells you this based on the order flow within the bar- so it is showing you something you cannot see and something about the quality of the movement inside the bar. A Trigger line is often after a line of the opposite color, but it does not have to be in all cases (to view charts larger than shown, click them and press the ESC key to return). Once a signal line is issued and price begins to move, SST will often move the line as price moves. So, in the above mentioned blue buy line, it would be moving the blue line up, trailing price as it goes. As soon as the line moves to a second new position from the first (i.e. a blue line is added above the first one), we call it a Trail line. 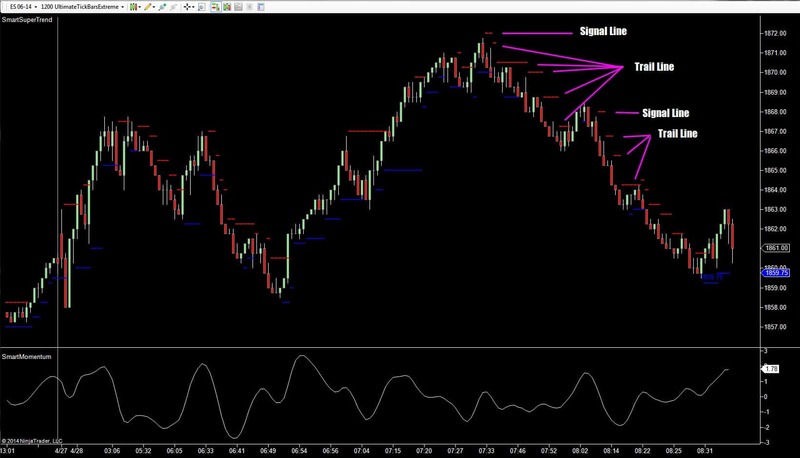 The second Trigger system is to trade a break of this Trail line. The third Trigger is the most stringent of all because you want both conditions. In this case, we get the blue buy line but wait for price to go through the trail line. 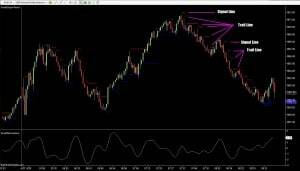 This method is telling you two important things that give you a confirmed entry. In plain English SST would be saying (for a buy), I am currently moving through an area of strong selling in price from the past, but at the same time, I am seeing very strong buying activity that supports the higher price change. In this way, I have a kind of value area price breakout that is occurring on strength. So enter on the Trail line on a stop. 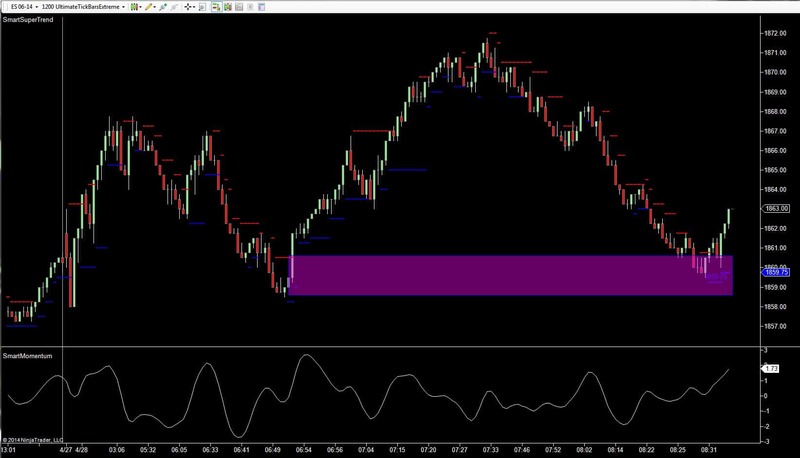 In this case we would want to set the tool offsets tightly and look for areas of good trade placement where the change in balance is occurring. You may choose to trade SST on its own, but your best opportunity with these triggers will be to filter it with a support and resistance analysis (i.e SmartSupportResistance, SmartVolumeProfile, LogikVolumeWand, floor pivots etc.) or oscillator reading techniques (tools such as the SmartSuperMACD or SmartMomentum). As is the case with any good system, there are usually elements that are working against one another; a constraining element that identifies context and a triggering system. The nice thing about SST as a triggering system is it is trying to make sure you are entering where your entry is somewhat protected due to the order flow. This can stack things in your favor a bit, giving you an edge. SST can be used as a trailing stop also. We discussed how the signal line is followed by a trail line. As a line trails price movement, SST is saying (for our upward moving market) I see strong buying as we go higher so the market is not that likely to go lower here so it is safe to move the stop higher to this area. 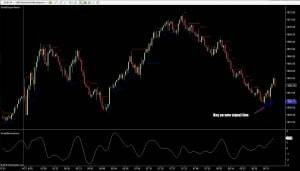 Of course as the market goes higher and higher you may wish to protect your position even more using discretion because SST is always placing the levels outside of the bar (below in the case of the upward moving market), and it may be appropriate to tighten more for your money management. SmartSuperTrend can also be used as a zone supply and demand system. When markets pivot, there is a shift in supply and demand, and from where buyers are in control and sellers are in control. These are important areas on charts. 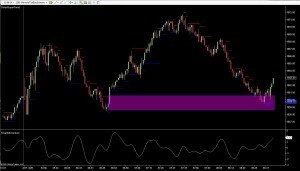 When you see a market turn and you see a red and blue line that defines that pivot area on the chart, you can draw a box forward from that point. Because this area is made of strong buying and strong selling, it defines a battleground area on the chart where supply and demand shifted. When pricing comes back into that region, you will often see a turn again. So you look for appropriate signals around those points. 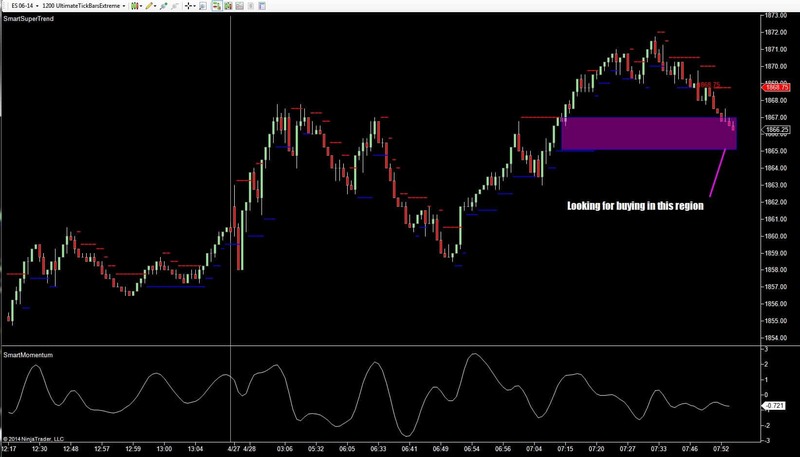 These are always counter-trend type scenarios, so you can use tags into these areas to enter with a bigger trend or if the market is, for example over bought and is tagging into one of these zones. There can be a bit of an art to drawing zones as in the above example. You first identify a pivot on the chart and, while using SST in Backtest mode (as shown above), find the most recent red and blue lines or the highest for a swing high pivot or the lowest for a swing low pivot and draw it. Experiment and adjust your technique as you go. Sometimes the market will not be moving much and will consolidate within a zone or between a red and a blue line. 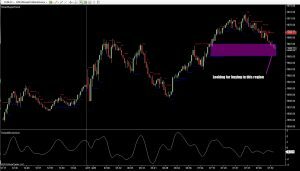 In these cases, SmartSuperTrend is telling you to use caution because you are trapped between two areas of strong buying and selling. This is true because SST should be outside the lines if the market is trending (above a blue line and below a red line). If it is between them, then the market may be consolidating and caution may be the best policy. So what is so Smart about SmartSuperTrend? It can be used in many ways to meet your needs- As a triggering system, as a support and resistance and supply and demand system as a position management system. It can also help you to know when a market is in consolidation. These are all excellent applications of SmartSuperTrend. This is particularly true when used prudently in conjunction with other systems, SST can give you an excellent edge in your trading. Get Smart and get SmartSuperTrend today!